Gurudev’s Birthday. It falls on the day of “Basant Panchmi tithi” according to “Vikrami Samvat” (Hindu calender). Though, according to Guruji, His Birthday falls on the day of “Maha Shiv Ratri”. 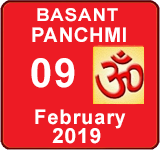 Basant Panchmi falls in the month of February and sometimes in January every year. The day is celebrated with much joy and happiness every year. People in large numbers offer their prayers at Gurudev’s Samadhi at “Neelkanth Dham”. Langar starts from the Morning hours and carries on till late in the evening. Thousands of people flock in, have Darshan of Samadhi, take blessings of Mataji and eat the Prasad (Langar). Though such a huge crowd, continues to exist the whole day, there is complete silence and discipline and people come in queues, chanting mantras within. A total divine and blissful atmosphere carries on throughout the day.